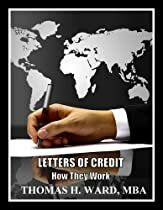 If you have a small business and want to expand into the international business it is necessary to use and understand how Letters of Credit work. It is also very important to keep track of your cash flow and know what your small business net worth is in order to obtain any loans or credit lines. Using this book, you can answer any question you may have about using Letters of Credit. After reading this you will be an expert and be able to use this powerful tool to help your business start international sales with little to no risk. No risk is the key when selling outside the good old USA as there are many ways to get burned. This book provides a step by step guide how to open a Letter of Credit.